While the site is still being developed and will evolve over time, this allows is to begin minting datasets via Datacite as the url landing pages will stay the same over time. C4D Workshop @ Glasgow University And City University! In the coming weeks we will be holding a Workshop to present our findings during the C4D project and its outcomes. Unable to attend? At present we are in the process of scheduling a second workshop event to be held at the end of July/Beginning of August, details to follow in the coming days. We look forward to seeing you all at one of our workshop. The project is due to end 31st July. We met yesterday. Workshops – two broadly similar content – one booked for 12th July, second planned for London or other location possibly 25 or 26 July TBC. London event will be advertised soon. 2) I included some discussion around the project in my presentation at the Scottish Academic Libraries Training Group event yesterday http://salctgresearchsupport.eventbrite.co.uk/ and gave out A4 versions of the poster. This led to a number of attendees approaching me at the end and asking for more details and discussing how we could keep in touch. https://groups.google.com/forum/?fromgroups#!overview and send a join request. 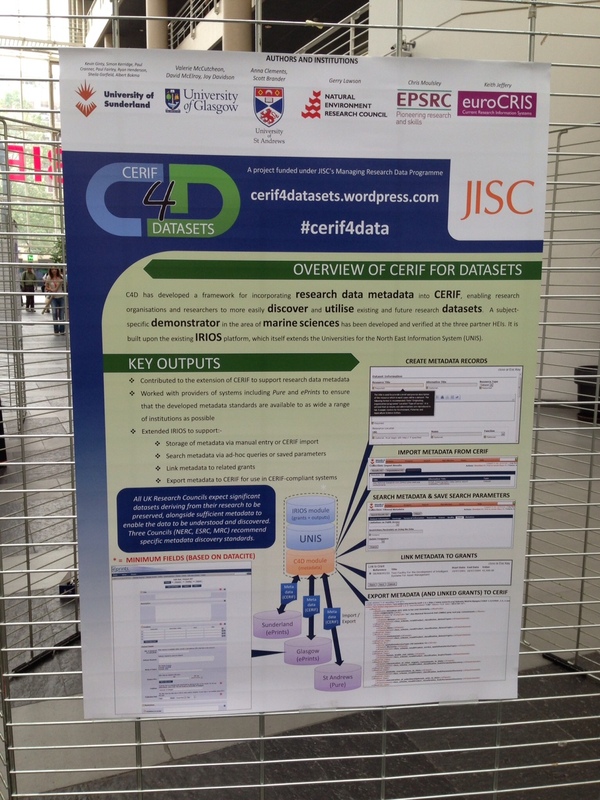 Our C4D poster is currently on display at the ARMA conference. Looks like we are getting closer to budget transfer from Sunderland so will be able to progress some activities more quickly soon. Sunderland have had to step back from leading the project but maintain an interest – and hopefully will be able to come along and share information at forthcoming events. So full steam ahead with organising our workshops. 12th July confirmed for Glasgow. Booking will be available soon. A further date will be announced for another venue probably somewhere in England.